Many people know Trinity Cathedral as a historic landmark, downtown Cleveland’s first green building, and a gathering place and center for meetings and events. Trinity is all of those things and more—but most of all, it is the home of a vibrant, inclusive congregation seeking to follow God’s call in the heart of the city. Some of us have been Episcopalians all our lives, and others of us are new to church or to the Episcopal Church. We come from all walks of life and all parts of Northeast Ohio, but we are united in our mission to proclaim in word and action God’s justice, love and mercy for all creation. Newcomers tell us that they are drawn to Trinity by the friendliness and diversity of the people, the beauty of the building and the worship, the excellent preaching, the music and the congregation’s commitment to ministry in the heart of the city. Trinity changed my life. It really did. I came here in college when I was sorting out my faith. When I was a new Christian and a new Episcopalian. Sitting in the corner, trying not to be noticed, but rather trying to struggle with the Big Things: God, life, future. And Trinity was the place that made me feel like, yes, this can be me. I can be this. I can be here. Trinity’s worship services are known for their vibrant and innovative, yet distinct, liturgies. Peace and justice ministry is essential to the soul of our community; each week, we feed the hungry, care for the sick, and tend the earth. Our direct service goes hand-in-hand with advocacy, as we aim to inspire, convene, organize, and participate in interfaith conversation and action for the rebuilding of a just and sustainable Greater Cleveland. Our education program offered regularly on Sunday mornings and Wednesday evenings, features renowned speakers, local thinkers and activists, and small-group discussions on books, spirituality, and the issues of the day. In recent years, our speakers have included Krista Tippett, Jonathan Kozol, John Shelby Spong, Bishop Gene Robinson, Diane Rehm, Kathleen Norris, James Carroll, Rabbi Arthur Waskow, evangelical Christian activists Richard Cizik and Shane Claiborne, and interfaith leaders from across Northeast Ohio. Music and art are at the heart of the way we worship God and reach out to the community. Trinity’s choir and other ensembles, including jazz and bluegrass bands, perform at weekly and special services, while lunchtime and evening concerts present the best of Northeast Ohio’s classical and jazz music. Trinity’s ministry of place is vital to our civic mission and our collaborative relationships with people and organizations in Greater Cleveland. In 2015, Trinity Commons was host to more than 1,000 meetings and events attended by more than 17,000 people. 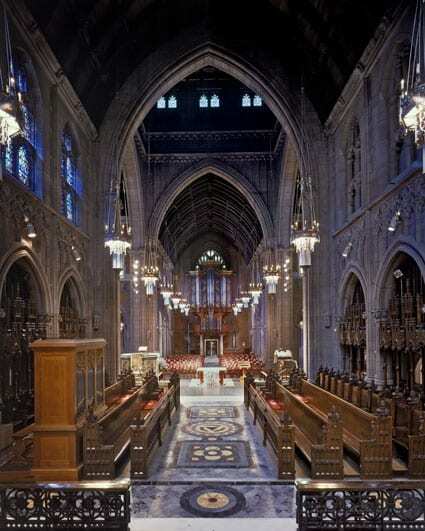 Trinity Cathedral is the cathedral of the Episcopal Diocese of Ohio, which comprises more than 24,000 Episcopalians from 103 parishes in the northern half of Ohio. The Cathedral is the seat of the Bishop of Ohio, currently the Rt. Rev. Mark Hollingsworth, Jr., who is the diocese’s eleventh bishop. Each year Trinity welcomes members of the Diocese’s parishes to their cathedral for youth retreats, clergy days, meetings, confirmations and other events. The mission of Trinity Cathedral is to proclaim in word and action God’s justice, love and mercy for all creation. We strive to be one of the world’s great cathedrals, a vibrant community of faith, and a leading institution in Cleveland – a model of the church as sacred public space for celebration, culture, charity, commerce, conversation, and collaboration in the heart of the city. We aim to inspire, convene, organize, and participate in interfaith conversation and action for the rebuilding of a just and sustainable Greater Cleveland; and to invite, encourage and equip the members of the Trinity congregation to join and promote such efforts. We seek to promote a holistic and loving expression of Christianity through engaging worship, authentic community, meaningful ministry, spiritual practice, personal wellness, vocational discernment, and leadership development. All baptized people are ministers of the gospel, are guided by the baptismal covenant, and are called to follow Jesus. Faith is a life-long journey of spiritual formation, education, discernment, and personal wellness. Radical hospitality embraces the unexpected and sees God in one another and in the world around us. We welcome, invite and bid seekers to join us, but we never coerce and condemn those of other faith traditions, and we promote interfaith understanding and cooperation. Peace, justice, reconciliation and love are at the heart of the Gospel. Honesty, integrity, creativity, mutuality, excellence and community infuse our mission and ministry. Our stakeholders include our congregation, diocese and community.